Why has it taken me so long to write another blog post? Well, aside from the fact that whenever I actually had time to write one, I simply didn't want to, we have been experiencing a veritable whirlwind of changes recently. Some planned, some not-so-much. I will break everything up into a few separate posts so as not to overwhelm you (or myself for that matter), as there is a lot of info to be shared. Okay, so tax time rolled around, and - as we always do - as soon as we had every shred of paper we needed to do our taxes, we did 'em. We file online because I have no idea how to do it myself, and it's just easier that way. Boy were we excited to find out that we were getting back way more than we thought we would! What to do with that money? Well, first we paid up a bunch of our debts, and then we were going to use some of it to buy a second vehicle because our truck is constantly flipping us the bird and we wanted to like... save gas money for some stupid reason. But one day while driving to town Ryan made a different suggestion: "What if we took the money we were going to spend on a car and invested it into the kitchen so we can get certified and get crankin' on selling our stuff?" (If any of you know Ryan, you'll know this is probably exactly what he said... verbatim). The nano-second after he said this I felt a little irritated... We need a second vehicle, and I had my heart set on buying one with this money! But the next nano-second my thoughts shifted, because we had just found out via the Maine USDA website that if you wanted to sell perishable food-items containing meat, uncooked dairy, etc., you have to have a separate commercial kitchen... Which means that we couldn't use our current kitchen to produce anything except baked-goods and foods that don't contain meat, and even when we are able to build our kitchen out in the garage, we would still have to use our already-existing kitchen for our own personal cooking and food preparation. So I turned to him and said I could agree to hold off on buying a second vehicle so long as he didn't raise a stink about how much gas the truck uses when I want to take the girls out or go somewhere. We both agreed, and we started on our kitchen! 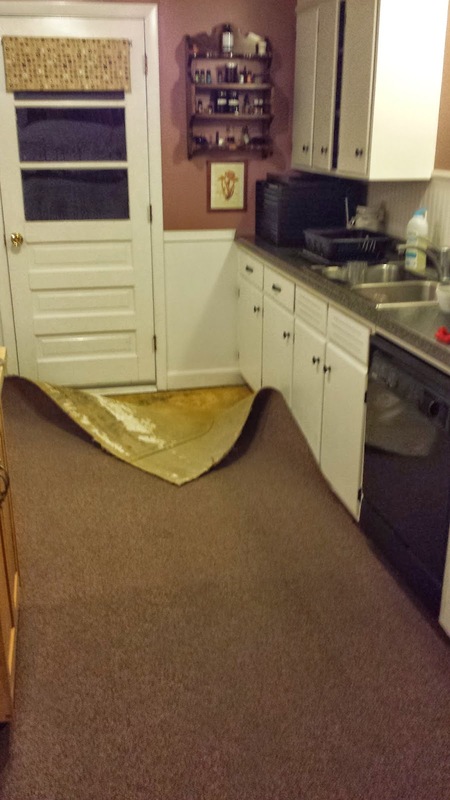 Now for those of you who have never seen our kitchen before, it wasn't the loveliest of places. It wasn't actually horrible-looking by any means, but it had indoor/outdoor carpeting in it.... seriously. (It's in both bathrooms, too..... gross.) So our first order of business was to find some hard flooring. 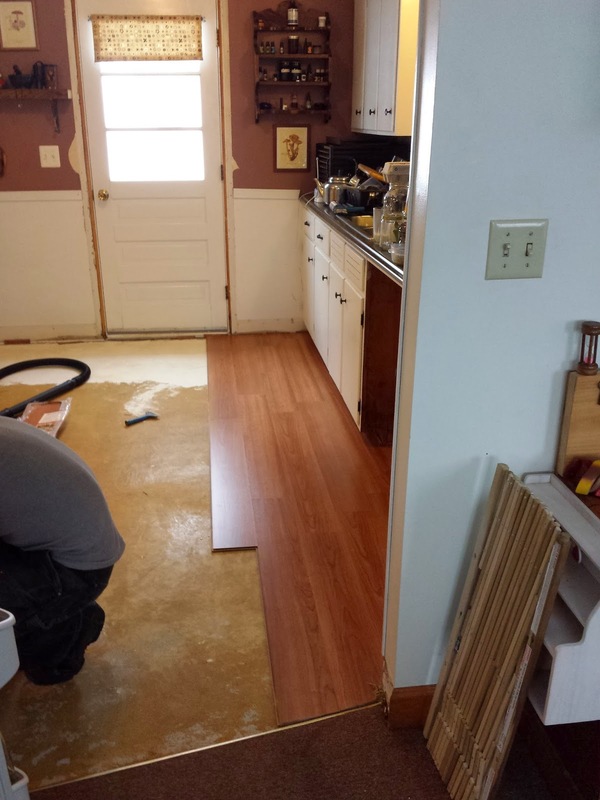 Obviously we would have loved to put real wood flooring in the kitchen, but the reality is that we are on a strict budget, so we went to Marden's and found a great deal on some American Cherry laminate flooring. The results? Awesome. We struggled a bit trying to lay the flooring down because A) the subfloor (concrete) was uneven and we had never leveled it before so that didn't exactly turn out perfect, and B) we didn't have the right type of pry-bar for the job, so getting certain pieces tapped together properly was a challenge. 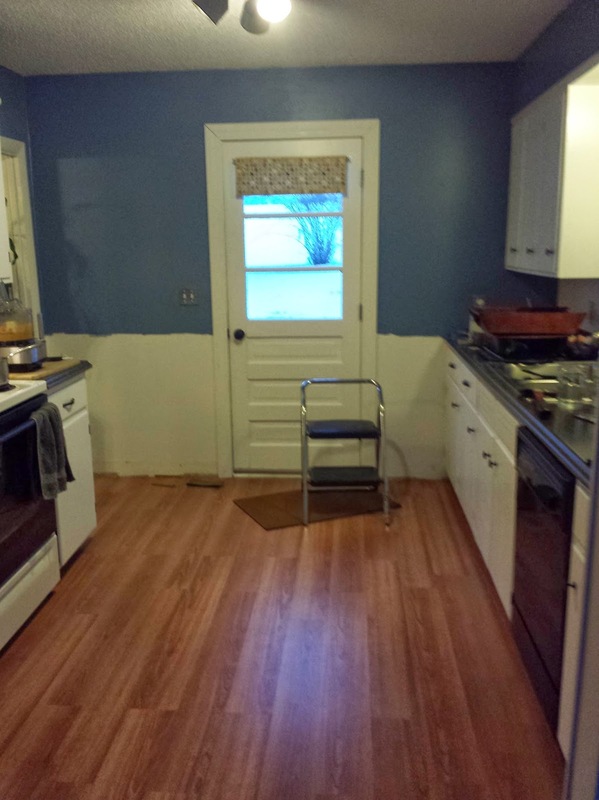 I'm sure we could have done a more precise job had we had some experience with laying down our own flooring, and of course if we'd had the right tools, but even with those shortcomings the kitchen turned out pretty awesome! So in this photo you can see the carpet being ripped up... it was seriously gross. It's been in the house since 1979 I think..... ew. 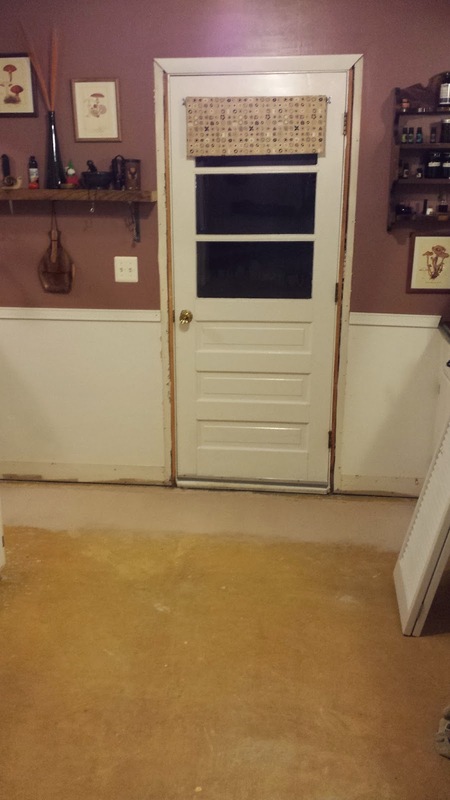 Here you can see our "Mauve" walls, and the glue-y floor that was underneath the carpet. The beige stuff near that wall is the floor leveler. And here we have our wall during the process of peeling paint-covered wallpaper off of the wall... the glue remained behind... I never should have picked at that little spot next to the door. Just look what it led to!! Our first few rows of flooring. Exciting! 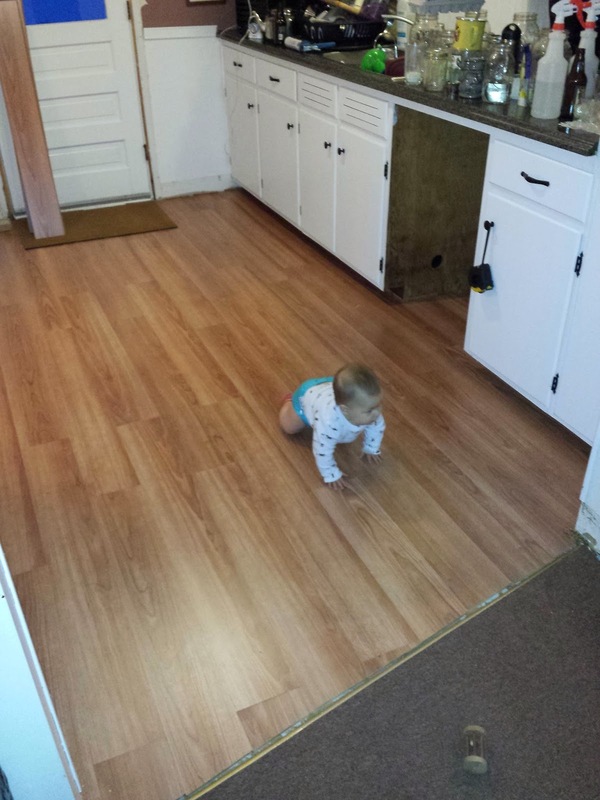 Sophia testing out the newly-finished laminate flooring! 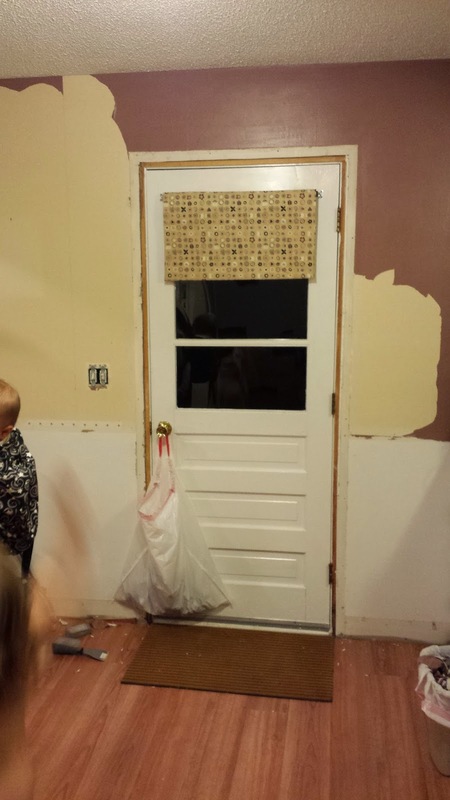 In addition to the flooring, we painted the walls "Americana Blue" and painted the door, trim, and cabinets "Marshmallow White." It seriously looked like Marshmallow Fluff when we opened the paint can, and inspired me to make a batch of healthy homemade marshmallow fluff using this recipe! We have also put in a new light fixture over the sink, and the trim is nailed back up, but the kitchen hasn't been photo-worthy yet so as soon as it is I'll take a photo of the almost-completely-completed kitchen. Our last projects are to put chocolate-brown tiling up as the backsplace behind the sink and (if we have enough) stove, and to remove or cover up the popcorn ceiling, neither of which we are really too excited about doing, but the ceiling has to be easily-cleanable in order to get the kitchen certified.... and so we must.